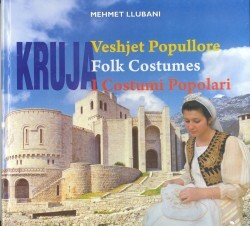 In three languages (Albanian, English and Italian) the folk costumes from the Kruja region are shown in many pictures, most of them showing the costumes from three sides: front, back and side. These views give the reader a perfect idea of the total dress. Apart from these there are many pictures showing details of parts of the costumes, decorations and jewelry. In the first part an overview is given of the different ethnographical regions of Kruja: Kurbin, Rranxia, Arbnia (Mysja), Fusha e Krujës and Benda. Also the costumes from people from Kosovo who settled in the region are shown. A second part is about the children's costumes.The third part is about the folklore groups from the region that took part in the Gjirokastër folklore festivals. Finally the musical scores to a song about Kruja and a short biography of the author are found on the last pages. As background to the costumes views from Kruja and surroundings is seen. A different approach to a book about folk dress, but a pleasant one.